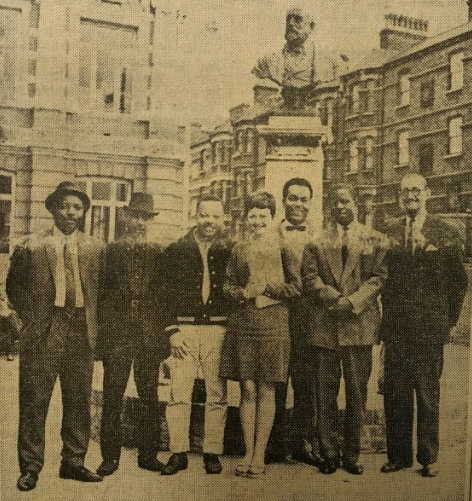 The newly formed Lambethan Party posing for a photograph in 1967 outside Brixton Library. 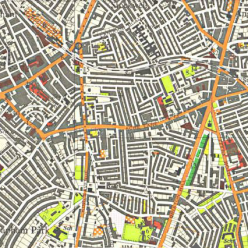 Black London Histories is working in partnership with Black Thrive to build a map of memories of black Lambeth. We will be holding a public event during Black History Month 2017, in which local historians, activists, artists and residents will discuss Lambeth’s pasts as a centre of black settlement in London. All are welcome, and we are hoping to prompt memories of Lambeth to develop the map in new ways. We will be encouraging those who attend the event to add their memories to the map, and build it up as a resource for future generations. Below is our map of Lambeth as it currently stands. The places pinned on this map are the result of research in local libraries and archives. You can click on any of the pins to read more on these places. The map attempts to identify the key areas of black social life, political activity, shopping, and cultural and entertainment spaces. At our event, we will be inviting audience members to reflect on their own memories of the sites currently mapped, and to make suggestions for other locations that they think are significant to the history of the area. If you are interested in local history, please do come along and join the conversation! And if you have thoughts on what should be included in this map, or on how the current sites are described, please do come and tell us. You can also send us details on sites you would like to see included by emailing Rob Waters at R.Waters@sussex.ac.uk. Please include as much detail as you can, and I will do what I can to add it to the map.